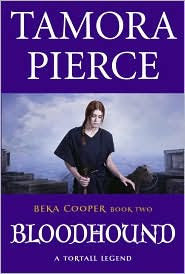 Along with other fans, I'd waited way past the scheduled publication date for Bloodhound, the second book in Tamora Pierce's Beka Cooper trilogy. According to the acknowledgements, Pierce went through a move, then a car accident followed by physical therapy and surgery. No matter how long we had to wait, Beka's continuing story was worth it. In Bloodhound, Beka is no longer a Pup, a rookie cop, member of the Provost's Guard in Corus, a city in Tortall. She's a Dog, but can't seem to keep a partner. Either the partner is too lazy, or Cooper is too eager. However, when counterfeit silver coins turn up in the city, leading to a bread riot, she finds herself with two partners, and an undercover assignment. Cooper is to work with her old mentor, Clary Goodwin, tracking the counterfeiters to Port Caynn. And, her other partner is Achoo, a renowned scent hound that she rescued from an abusive handler. It's a case that takes Cooper out of her comfort zone, a place where she knows the good and bad Dogs, and the Rogue is a friend. At Port Caynn, they run into a small group that aided them in the bread riot, including Dale Rowan, a charming courier and gambler. Despite the attraction, Beka can't get past a suspicion that gambling is involved in the passing of the fake coins, and she worries she might be losing her heart to a con man. But, Dale and his friends allow the two Dogs to find an easier entry into the gambling world of Port Caynn, including the areas controlled by the town's top criminal, Pearl Skinner, the Rogue. Cooper, Goodwin, and Achoo must find enough information to send back to the Lord Provost before the people realize their money is worth nothing, the crops are poor, and they may not be able to feed their families over the winter. Someone is deliberately destroying the economy of Port Caynn, and the problems will extend to the rest of Tortall. No one creates strong female characters as well as Tamora Pierce does. Beka Cooper continues to grow before our eyes. She started as a young girl of the streets, and, under the guidance of the Lord Provost, she became a member of the Guards, training as a Pup, and now, finding her legs as a Dog. She's still insecure at times, but, with the backing of her god-cat Pounce, Achoo, the new scent hound, the other Dogs, and, of course, her mentor, the Lord Provost, Beka is learning to operate as a Dog. She's capable of investigating a case, fighting criminals, and working with a scent hound, and her own variety of spies, pigeons and dust spinners. And, she's learning to be a woman, flirting, wearing makeup, and taking responsibility for her own birth control. Beka Cooper is another one of Tamora Pierce's "sheroes", female heroes capable of being strong and a woman at the same time. Pierce's Beka Cooper series might be considered fantasy, with the mages, magic, and cats, pigeons, and dust spinners that can communicate with Beka. However, they are also excellent police procedurals, with the emphasis on training, then undercover work, and the authority of the Dogs in the cities. It's also interesting to find torture, such as waterboarding, used as methods of interrogation. Pierce doesn't miss any tricks in her excellent stories. Sometime in 2010, Mastiff, the third book in the trilogy is scheduled for publication. Those of us who are fans will want to see Beka Cooper return as a full-fledged Dog, but it will also be interesting to see what happens in her personal life. No one combines work and personal life as successfully in a fantasy as Tamora Pierce does. Bloodhound will undoubtedly be on my list of the best books of 2009. Bloodhound by Tamora Pierce. Random House, ©2009. ISBN 9780375814693 (hardcover), 560p. Personal note - I wasn't the only one in the family who enjoyed Bloodhound. I think Josh, our youngest cat, was interested in the sections of the book that dealt with Pounce, the cat-god from the constellations. Josh thinks Pounce didn't have a big enough role in this book. Thank you! And, I'm glad he stayed there long enough for me to get a picture. I've had that bookholder since I was in college. I don't know what I'd do without it. I'm not sure your review convinced me--but Josh sure did!!!! You can tell how far Josh was in the book, too, Maria! He thought it was terrific, even if it was called Bloodhound. Clearly, he thought the book should have been called "Pounce"! I just love that photo. It would make a fantastic scrap page. You're right, and he's hoping Pounce has a bigger role in the next book. Thanks! I love it, too. I ran to get my camera when he was sitting there. I was just lucky he was still there when I came back. What an adorable picture! Josh is precious. I have a black kitty too with beautiful green eyes. Thank you! I bet your cat is beautiful with green eyes. Those black cats are extra friendly, and stay soft. They're pretty special cats.